Our guild made items for a local charity, Sarah's Inn in Oak Park. Here is a description of their work from their website. "Sarah’s Inn provides comprehensive services for families affected by domestic violence so that they get the support they need to find safety, rebuild their lives, and heal. Our legal support services help ensure that survivors of domestic violence receive equal rights and protection under the law. Sarah’s Inn is a community leader in educating children and adolescents about how to cultivate healthy relationships to prevent future violence from occurring. Working in partnership with local stakeholders, we run education and training programs to promote an appropriate community response to violence." They do great work right here in our community. We were so happy to be able to gift them some items to make their counseling rooms more comfy. We all worked from the same color palette, and made small quilts and pillows in either solids or prints. These are the items I contributed. As a guild we gave much more. I'm always grateful for opportunities to use my sewing for good. I needed to make a gift for our good friends. They were expecting their second baby. But I hadn't made a quilt for their first baby, so the second baby couldn't get his own, right? That's my logic, anyway. So I thought a family quilt would be more appropriate. I made a large throw size quilt (75"x65"), big enough for Kristin and her little boys to snuggle with right now, but sorry, Colin and Taylor boys in the future, it's definitely going to be too short for you. Without really planning it, this quilt became a sampler for the classes I took at QuiltCon 2015. I learned to make the circles and pebbles in a class with Rossie Hutchinson. I also chopped up the doodle I made in Sherri Lynn Wood 's class and incorporated that into the patchwork. The construction of the top was improvisational and ruler-free. I thought much too long and hard about what to do with these blocks from my QuiltCon classes. In the end I threw them haphazardly on my design wall and loved this simple layout. I quilted this on my Juki 2010Q and it's far from perfect but I love it. I did echoes in a few spots and then straight lines or grids on the rest. I'm proud of this one. Everything came together beautifully. I did a huge log cabin block for the back of the quilt. Last year I played with making letters using drunkards path and half square triangle blocks. I wanted to create the entire alphabet in a similar style. I created upper case, lower case, and condensed upper case letters, and put them all together in this quilt. My goal in designing each letter was to use the simplest piecing possible to clearly convey the shape of the letter. That's why I call this my Simple Shapes Alphabet. I hope to someday write up a pattern or tutorial for all of these letters. They are really pretty simple and many quilters could probably figure out how to make them just by looking at them. A few tricky letters got special treatment, but they are for the most part comprised of whole squares, Drunkard's Path blocks, and half square triangle blocks. Pattern-writing is not my strong suit, so it might take a while for it to happen. But I'll get to it one of these days. The fabrics for this quilt were generously provided by Andover fabrics. They are mostly Lizzy House prints and Andover's textured solids. I loved working with them. When trying to figure out the layout of the letters and how to use the colors I had been sent, Carrie's Bradshaw's curtains (from the early seasons) came to mind. I love the big grey and coral stripes. Quilted by Nikki Maroon. Finished quilt measures 77"x93". A year and a half ago, my dad's mom, my last living grandparent, moved out of her home and into a small apartment attached to a nursing home. We had been wanting her to move closer to family for a long time. So while we were happy she was finally living closer to my parents, so they could look in on her from time to time, the move was very hard on her. I wanted to provide a bit of comfort, if I could. I chose colors and floral prints I thought Grandma would like. I included quite a bit of double gauze in the quilt which made it extra soft. I worked from a pattern called Bows and Braids by Jocelyn Ueng. The final quilt measures 58"x68". I had it quilted by Sarah Wilson of crinklelove. My grandma was 89 and healthy when I started this quilt, and she was 90, hospitalized, and rapidly declining when I finished it. When she unwrapped it, with help, from her hospital bed, she said, "I don't think anyone has ever spent so much time on me before." This from a woman who had knitted and crocheted countless items for others through the years. I regret that we only had three more weeks with my grandma after that moment. I wish I had given her a quilt earlier, that she could have used and enjoyed longer. But I'm glad she had it for a time, for warmth and comfort in unfamiliar beds, and to know how much she was loved. My grandma has been gone for almost a year. Her quilt now lives at my mom's house. I love seeing it when we go home to visit. 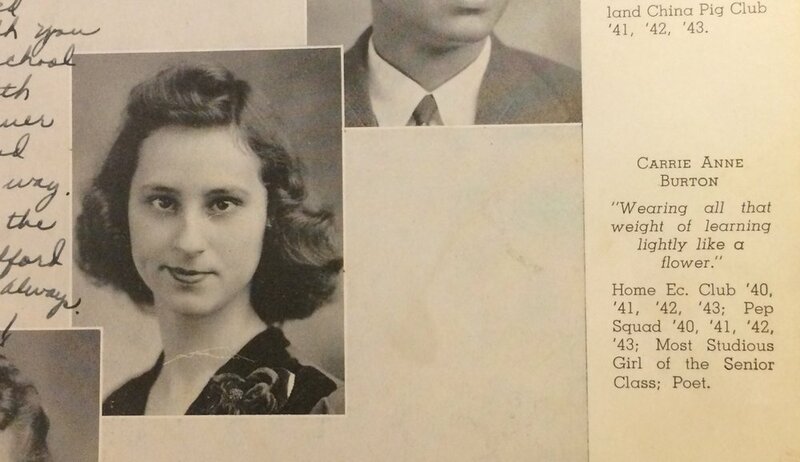 my grandma's high school yearbook. I love her quote. I was asked by Lindsey of Pen and Paper Patterns to try the pattern for her Marigold Quilt. I enjoy following her work on Instagram. Her style is so clean and cute, and she is always churning out new patterns. I also quilted this myself, by echoing the flowers. I chose a wool batting to make this quilt extra puffy. I went with a combination of solids for my version of this quilt. I love how it turned out, but I know from seeing other testers' versions that it looks amazing in some well-chosen prints too. Thanks for asking me to test this adorable pattern, Lindsey! Now I'm just waiting for someone I know to have a little baby girl.